We denounce to the young people, to the peoples of the entire world, the ongoing crime of US-NATO-Israel against the Palestinian people. The US decision to declare Jerusalem as “the capital of Israel” and to relocate there their embassy from Tel Aviv, as well as the EU’s unchanging stance, which equates the “perpetrator” with the “victim”, paves the way for a new imperialist crime. This provocative action by the US government is not a casual act, but it is part of the general intervention plans of the US in the region of Middle East aiming to secure their interests. The aim is to cancel the solution of the establishment of an independent Palestinian state with the 1967 borders, with East Jerusalem as capital, for what the Palestinian people have struggled and shed their blood for so many years. In that way, intervention is taking place, and developments in favour of USA and its allies are being prepared concerning the in the uncertain situation that is formed in the Middle East, especially after the defeat of the “Islamic State” in Syria, while taking into account the context of fierce competition that takes place in the region. We denounce the repression of the struggle of the Palestinian people by the Israeli state, which, along with the support of the United States, is already intensifying barbarism. The just reaction of the Palestinian people to this decision is being confronted with murders of protesters, arrests and persecutions. The Israeli repression forces do not hesitate even to contend with children and adolescents, such as the two teenagers who were murdered in early of January, as well as the 16-year-old Ahed Tammimi, who is being prosecuted by Israeli military court for her action against the occupation. We welcome the thousands of Palestinian youth who fight courageously against the barbarity of the Israeli state for something obvious, their right to live in their home country without foreign oppressors. The struggle that is carried out in our countries, against the injustice, poverty, oppression and the imperialist war, is an international struggle, a struggle that contains solidarity towards the struggle of the peoples against injustice and oppression in all over the world. We call every young person, in our countries, to condemn the ongoing crime against the Palestinian people and to denounce the new intensification of barbarity. To decisively condemn the torment of the entire Palestinian people, the violence exerted by the State of Israel keeping thousands of political prisoners, constructing the wall of shame, continuing the settlements and the ongoing occupation of the Palestinian territories. 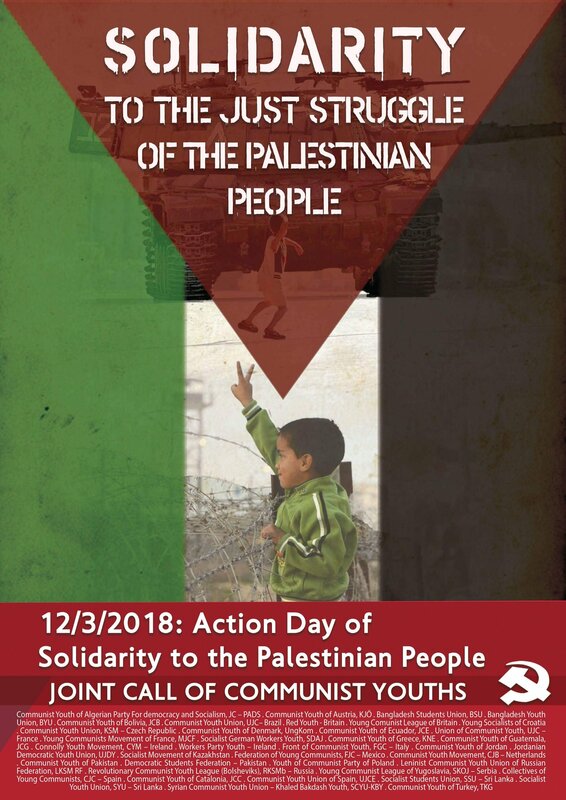 We call Communist Youth Organization, other anti-imperialist organizations, mass organizations of youth from all over the world on the day of international common action of solidarity towards the people of Palestine on 12/03. We coordinate our action; with various activities we give an internationalist response to the imperialist plans! The end of settlements and the withdrawal of the settlers who have been settled within the Palestinian territories defined by the borders of 1967, the releasing of all the political prisoners and the returning of the refugees.